Have you ever received a "Tweaking CC?" A tweaking CC is a message sent to you, to bring pressure to bear on a colleague or subordinate. It's usually counterproductive, but it's one of the myriads of ways that email has become the bane of the modern workplace. Would you like to know how to get them to stop? Read this book. You'll also learn about "flame wars," internal spam, and typing while angry. Sixteen essays, each one a quick read, each one insightful. Have you This item is available in downloadable format only. Since it isn't shipped, be sure before you order that your shipping charges are 0.ever received a "Tweaking CC?" A tweaking CC is a message sent to a subordinate by a third party, CCing you, to embarrass or pressure your subordinate. Or it could be sent to a colleague, CCing you, for similar reasons. By bringing you into the conversation to expose supposedly ineffective or delinquent behavior, the sender hopes to modify that person's behavior. The tweaking CC is usually counter-productive. It wastes the time and emotional energy of all senders and all recipients. It is but one of the myriads of ways that email has become the bane of the modern workplace. Would you like to know how to get them to stop? Read Where There's Smoke There's Email . You'll also learn how to deal with so-called "flame wars," internal spam, and that most corrosive practice, typing while angry. I'm certain that the dozens of counter-productive email practices will expand as time goes on. People who ordered this item also ordered 101 Tips for Writing and Managing Email.Still, Where There's Smoke There's Email covers the ground as we know it today. 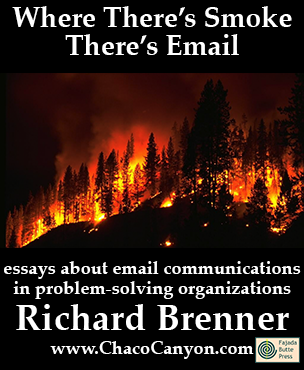 It even includes an essay on the ethics of email, which discusses the new ways email enables the unscrupulous to transgress on the rest of us. Where There's Smoke There's Email is in Acrobat format, which gives you several advantages. You can print it, and read it like any book. Or in electronic form, you can use the search capability of Adobe Reader to find passages of special interest to you. If you load it onto your laptop, tablet, or other mobile device, you can read it anywhere — and it's weightless, too. 49 pages. To avoid shipping charges, be sure to select "downloadable" for the shipping method.This item is also available at significant savings as part of a package of all my ebooks and tips booklets. Check it out!